Over Christmas break we treated the boys to a movie...for Aaron it was his first time ever and honestly I wasn't sure how it would go but thanks to MyBlogSpark and General Mills we were able to go for only a few bucks. A win win for all of us. We ended up having a great time! 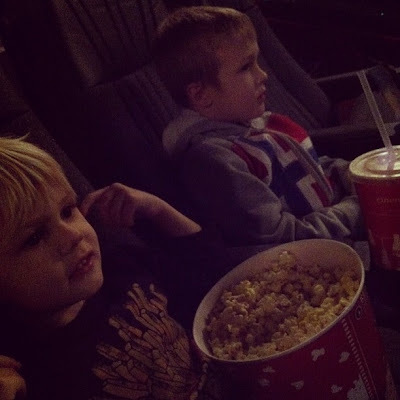 The boys were amazingly well behaved and we loved the movie (Wreck it Ralph). My Blog Spark sent me $24 of Emovie cash and a box of General Mills Cheerios to keep AND some of the same for one of you! We were able to use our emovie cash AS cash and since movie tickets in our town are $8 we were all able to go to the movies for $8 total. :) Not a bad deal. The last movie we went to go see was Les Mis and I LOVED it. I honestly can't remember the last movie we went to in the theater as a family. It is so expensive to take a family of 7 out! Fortunately my husband and I went out to see Argo last week and LOVED IT! I am so happy that Ben Affleck won the Oscar for it. An amazing story that deserved to be told. The last movie I saw in the theatre was The Last Stand...it was good, and had a good message, but was kind of cheesy. The last movie I saw was the Hobbit: An Unexpected Journey. I actually saw it twice, at the premiere and in IMAX 3D, and i was quite impressed. I'm a bit of a Tolkien nerd and I thought Jackson did an excellent job. Not perfect by any means but better than any other director. I saw Safe Haven last night-- It was cute but not as good as I expected. Much too dark for me! Thank you for a great giveaway. The last movie I saw in a theater was Lincoln and I loved it! Adult movie Argo & my son & I saw Wreck it Ralph. Would love free tickets. The last movie I seen was with my oldest son Garrett, Escape From Planet Earth. It was wonderful! The last movie I saw was Identity Thief and it was hilarious! :). Great movie for a much needed night out. My Husband and I saw Life of Pi - great movie but the book was better (isnt it always!). I am waiting to take my 4.5yr old to the movies but I havent found "the perfect one". What movie did your boys see? We last saw Wreck it Ralph, too. I liked it ok. It didn't get rave reviews from my kids either. But, not a bad movie. I saw Silver Linings Playbook a couple of weeks ago. It was good, but much deeper than I thought it would be. Our town has $5 movies. A couple of weeks after a movie has been out, club members get an email for four different movies that are $5 on that Wednesday and Thursday. That's about the only time I go, because otherwise it's so darn expensive. Sadly the last movie was saw was breaking dawn 2, it costs a small fortune in NYC to go to the movies so we rarely go. That said I'm finally taking my boys to the movies with friends tomorrow, they have not been to the movies in a very long time! I do not really remember the last movie I saw but it may have been Dark Shadows in Spring of 2012. I really wanted to see it so I won tickets from a radio station. It was a disappointment. I would love to see Lincoln or Les Mis. My husband and I saw Zero Dark Thirty. It was intense but we really liked it. I went to see Les Miserables with the hubby for our 6th anniversary (and first major date night since baby has come along...). Loved it! We're musical theater fans, so we weren't sure if it would live up to our expectations or not, but it did! 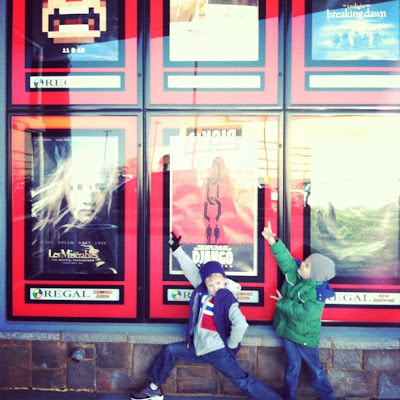 My 7 year old would be ecstatic though if I won movie tickets. The last movie we went to see was A Good Day to Die Hard...I'm not usually into action movies, but my boyfriend and his cousin out-voted me on this one. It was actually pretty good considering I'm not that familiar with the Die Hard franchise. Not so much a family-friendly affair, but it was a fun "date +1 event." The last movie I saw was "This is 40" with my husband. It seemed like the best parts were shown in the trailer. It was ok, but not great. Oh boy the last movie I saw was pre children. That would be 7 years ago. Since its been so long and I cant even think of a movie I last saw. I want to tell you that I really want to see Identity Thief. Looks so funny. what a fun drawing this is. Thanks for letting me participate. I went to Jack the Giant Slayer! It was this weekned with my husband and we had a wonderful time. We don't get many dates as I live apart from him due to my job so it is nice to get together and enjoy ourselves. The movie was fabulous! Even good for children though there is a lot of violence so I would recommend older school age children.